I go seriously geeky over autumn - it's without a doubt my numero uno season of the year. I have warm, spicy fall scents in my home year round (yes, even when it's 95 degrees outside) and I was the kid who would always insist on wearing her new sweaters the first week of school, no matter the weather, no matter the uncomfortable sweaty-girl-in-the-second-row factor. So when the first couple days of school are on the chilly side like they have been this year, I have to sit on my hands to keep from throwing up some autumn decor and making oatmeal raisin cookies. Doesn't that second picture make you want to just curl up in the chair and read a book? 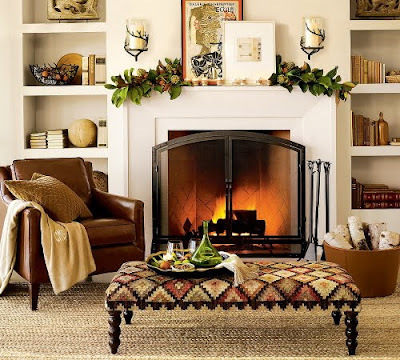 It looks so warm and inviting to me, without being over the top, beat-you-senseless-with-a-leaf-garland autumn-y. 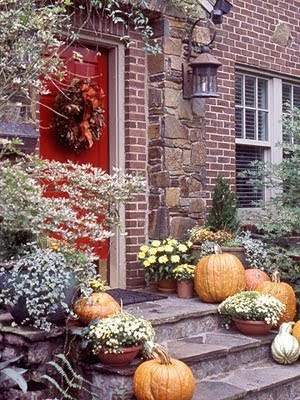 I know I'm not alone in my love for this season but I'm wondering... when is it socially acceptable to start decorating? And unless it's tomorrow, am I willing to wait that long? Probably not, friends. Probably not.